“Do whatever He tells you.” John 2:5. Ah, the Wedding at Cana. If the Gospel had a “Top Hits” billboard list, then this story would easily be in the Top Five, no question. Anyone who has spent any time in kneelers will readily recognize with warm familiarity, Jesus’ first miracle, turning water into wine in John, Chapter 2, which we heard in the Gospel this Sunday. And we Catholics, in particular, love this passage in the Bible, because not only is it the beginning of Jesus’ public ministry, but it also nods to Jesus’ most precious Blood in the Eucharist. I personally love it because, like any young, single New Yorker, I love a good party, and goodness knows that the key to a successful soirée is the perfect playlist to create the atmosphere, a compatible mix of people, and plenty of good wine to go around. But as I was reading the Gospel today, I saw this story with new eyes: a single phrase jumped off the page that gave me an entirely new perspective on this beloved “Old Reliable” reading. Five little words that pack a wallop of a punch. Spoken by Mary to the party’s servants, after the wine ran out at the wedding. This short phrase has actually been incredibly instrumental in my life. Having battled a severe case of anorexia during high school, ten years ago now, it was clear to see that my pride was literally destroying me. I was headstrong, and obstinate, and very, very sick. And I did not want to go to inpatient treatment to recover from my eating disorder. At eighteen years old, with over 40 pounds to gain, I didn’t want anyone telling me what to do, or how to live my life. At inpatient, there was really only one thing that healed my anorexia. It wasn’t their nutrition education program, nor their self love workshops. It wasn’t filling my mind with positive affirmations, or practicing “mindfulness” coping mechanism. Nope. It was one thing: Jesus. I was terrified to let go of my eating disorder, and put on that weight. I was alone, across the country from my family in a sterile and unfamiliar environment. And the only thing I could do was cling to God. Every single day, I poured over my Bible. And read through the Psalms, finding camaraderie with the Psalmists, many of whom were lamenting in prison, or facing persecution or death. I felt a personal connection with them. So I cried out to God. I clung to His words in the Gospels, and found strength and hope and courage in Him. And I clung to that hope. To that imagery. To that promise. Jesus can take even the most dire of situations and give them new life, and turn them around. Not just with adequate wine, but the best wine. And ten years later, as a whole, healthy and thriving young woman, I can tell you that His promise was true. We are that new wine. He can and will take our lives and turn them into new wine. But we have to surrender it. Leave it to the Blessed Mother to tell it to us straight. Mary, here, knows what Jesus wants from us: our surrender. Our trust. Our faith. We have to hand it over so that Jesus can do what He does best: restore, rebuild and renew. And just like at Cana, when He does, it “so reveal[s] His glory.” (John 2:11). Not ours, but His. At inpatient, I had to surrender my pride. I had to surrender all the hidden aspects of my anorexia that I was holding onto: my fear of weight gain, my secrecy and manipulation, my body image issues, my addiction to exercise. I had to give it to Him, and then do whatever He told me. And I did. We did – Jesus and I, together. And to this day, ten years in, I still follow that same motto, doing whatever He tells me, in order to protect my recovery. That looks like continually nourishing myself, being gentle with my body when it comes to exercise, spending intentional time with Jesus and His Word, seeing myself and others through God’s eyes, not having a full length mirror, and turning down situations like attending NY Fashion Week fashion shows, in order to protect my mind from negative thoughts. Because yes, faith is highly mental and spiritual, but it is also a very physical and active practice as well. My final thought today, is that at Cana, though the situation was bleak and seemingly doomed, Mary’s faith never wavered. She never once doubted that Jesus can and would deliver a miracle. Because that’s just what Jesus does, and has proven time and time again. He takes all things, and makes them new. Caralyn is the writer and speaker behind the blog, BeautyBeyondBones. It has recently been named one of the Top Three Eating Disorder Recovery Sites on the WorldwideWeb. She’s a twenty-something actress and writer in New York City. 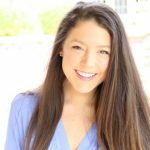 Having battled a severe case of anorexia and Ulcerative Colitis, she now uses her story of total restoration to positively impact others, and offer Christ’s hope and encouragement for those with eating disorders, and other forms of adversity. Her book, Bloom is now available! Beautiful; thank you for sharing your story and relating it so wonderfully to the Wedding at Cana miracle and to our Blessed Mother. This truly is beautiful. It always comes down to complete surrender, which we resist for many reasons, fear, shame, pride, self-absorption. It is a decision, as you show, more than anything else. Thanks for sharing your struggle and God’s response to your opening up to Him. This is very inspiring and definitely does “pack a punch”. It is one of those passages of scripture you read over and never really give to consideration. Very powerful and simple truth. Thank you so much for sharing this insight. Beautifully and wonderfully written sister! May His will be done! God bless you! Beautifully written. Thanks for your transparency and direction. I’m certain you are blessings others with your blog. I’m enjoying the message I obtain from it. Also, thanks for supporting me as well. I’m encouraged to continue to write because of you. Caralyn, this is powerful! What a message do what Jesus tells you to do! Surrendering is never easy. But giving up on our self-knowing and self-reliance is so rewarding, especially when Love is in charge! Congratulations on having your work published! I will continue to follow your blog. Your story is so inspiring! Beautiful post and a great lesson for us all. Thank you for sharing your wisdom. Oh my GOODNESS! What a powerful powerful, did I say powerful, powerful message! And to think, it spoke in more ways than one. In short, this was confirmation that I shared with a minister friend of mine TONIGHT. As he shared with me what the Lord had placed on His heart to do, he had consulted with someone, another minister and he encouraged Him to change what the Lord had given Him. The Lord told me to tell him the SAME words declared in your message. 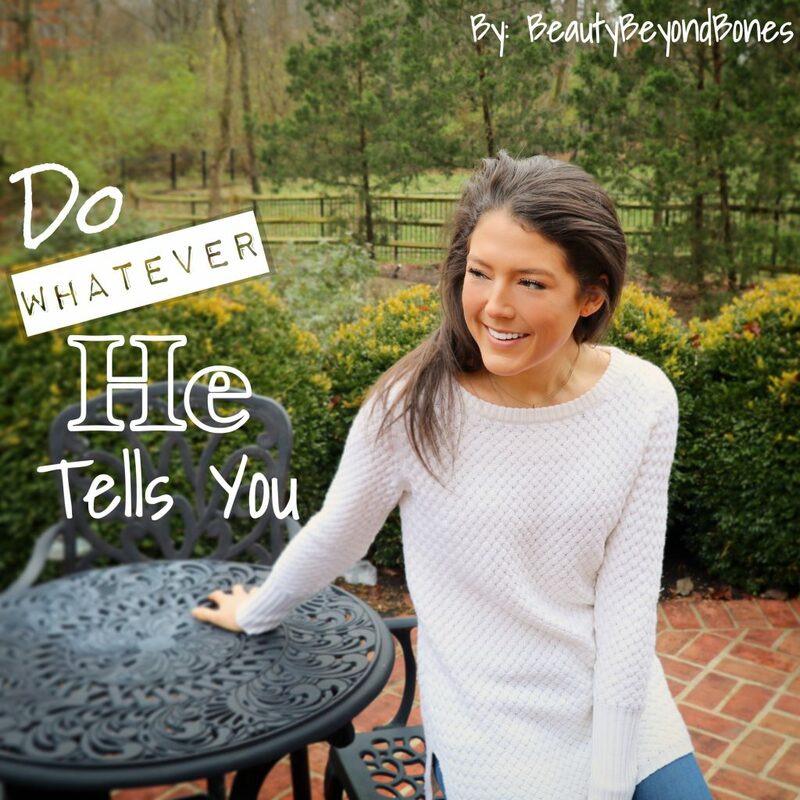 “Whatever the Lord tells/gives you, do it!” Thanks Caralyn for this message because not only is it confirmation on that, the Lord just whispered TRUST ME, I GOT YOU! Love ya Sis and KEEP ON SHARING! God is enlarging your territory as we speak! Continue being as transparent and bold as God has created you! Blessings, your brother in Christ, Anthony! Saw the email notification from your site, and seeing the title I had to read it. I was really blessed by it and ready to do whatever He says. Great insight as always, Caralyn! Very, very perceptive. Thanks! Will help me listen better this week to what Jesus is telling me to do. I love it when posts like this are crafted. Taking Scripture, and associating it directly with your life, which can then be applied to our own lives. Not all ministers or storytellers do this, but those who do it, usually do it well. You knocked this one out of the park! You’ve inspired me to re-read this story. Thank you! You are right on Girl. The Wedding a Cana, is one of the most intriguing accounts of Who Jesus is. Scholars have reached into many manuscripts and histories of the time to find what really happened and the true mind of Jesus. You have pulled out and focused on Mary and her words and that is where the meaning was hidden. Kudos to you for finding your meaning and purpose. With Love. Congratulations, on your feature article with WINE. I love the fact, that you wrote “We did it. ” And weren’t scared about it. That’s a real testimony of your faith, and walk hand in hand with Christ. Something you should know- One reason I visit Beauty Beyond Bones is because I know that I am going to be uplifted. The mixture of your energy and personality, is beautifully amplified by God’s touch. It magnifies out onto the world that you are His child. It speaks to those hearts that are paying attention, “I AM THE PRIZE. Set your hearts and focus on me and I shall give you your hearts desire.” Psalms 37:4. You did it, are doing it, and may you continue doing it together! In Jesus mighty name, Amen! Hey Caralyn. It is always so inspiring, and encouraging to read your posts. It is that way because you do not change, regardless of where you publish, in a magazine or your regular BBB, JESUS CHRIST is always first. That is so admirable, and positively not attempting to tickle every person’s ears. Surrendering is not easy. There are demonstrations in Scripture where not everyone did what Jesus told them, and they turned away. What I also see, and like in your post, when a third party, Mary, Mother Of Jesus, was involved, and spoken with, her words were paid attention to and followed. How often does someone go to another person, basically to get another point of view, because they really don’t want to do what Jesus is saying to do? We need love, care, and boldness. As a Christ follower we need to be in tune with Holy Spirit, and be discerning, that when a person shares a possible decision they are considering with us, to say “Do whatever Jesus tells you”, if we actually know through Holy Spirit prompting, that to be true. Sometimes a person’s deep desires may hinder what Jesus is really saying, so if asked we need discernment, and to speak Truth in LOVE. Again Caralyn, thank you for the great example you are, and model you set before us. God Bless you Abundantly as you serve Him Faithfully. Thank you for your kind words Caralyn. I am truly blessed by you, and thankful for your Christian friendship and Luv. Thank you so much by giving an identity to an addiction. Your post has given me the ability to think about where I have overcome and not be afraid to speak about it. Thank you for pointing out John 2:5. I feel like I have seen this line for the first time though I have read it several times!! I will need to write down my thoughts on this as well. Another good one C! Dying to ourselves is hard but ultimately letting go of our instinctual desire to do only what we want leads to immeasurable freedom! Amen ! I am still blown away by that startling reality of the gospel. Truly exceptional Caralyn! I loved reading how it was by filling your mind with Jesus that your were healed. God wrap His loving arms around you and warm you from the inside out. Blessed by this story, sister. Praying for you that your strength and mature example to all increases in Yeshua’s power. Amen. Jesus has shown me over and over again that placing my trust in Him only brings the most beautiful things even, more than I could have ever imagined. And yet, I keep doubting and getting anxiety about the future when I don’t have everything under control. Pondering these words in my heart is really healing. Thank you. Beautiful! Where can i find other articles by you? I would love to read more!